Doctor cleared me for 8-10 miles per week, which is half of what I used to run. Told me to limit hills and walk if it hurts. Speed work not recommended. Always wear orthotics. Showed me how to tie shoes to get more room in toe box. So guess I'll stick to 5ks and give up the half marathons. Okay. Compromise. I thought about making following doctor's advise part of the HOWs, but maybe not. I don't always, but usually. Do you? Edit: Yep, that's right. 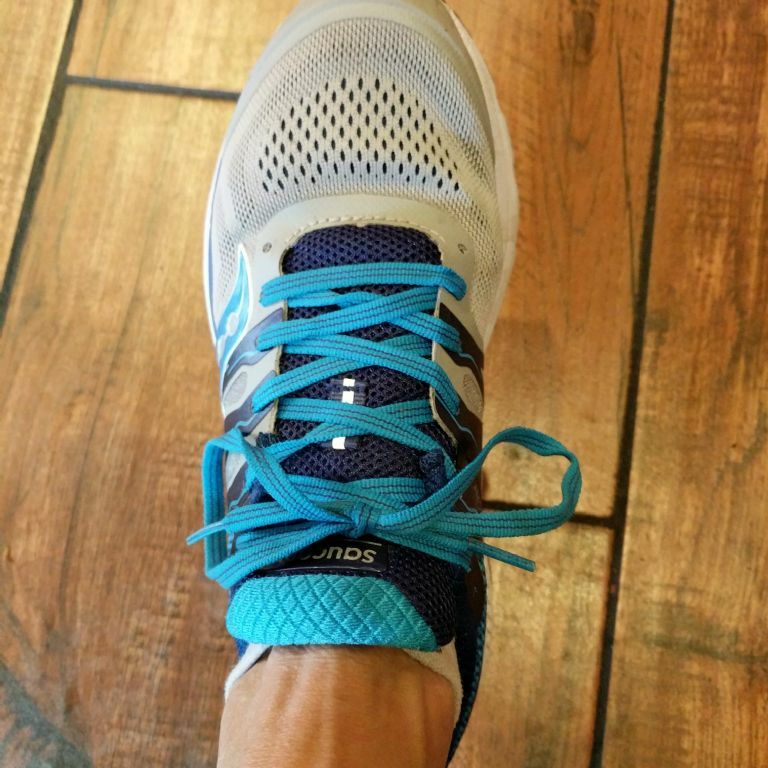 If you have bad bunions and need more room in the toe box, skip the first set of holes. I can tell a big difference already!! SO glad you are able to walk/run again. Yes, I had bunions on both feet but had them fixed years ago and am so glad. SO glad you can do what you love most! It's so good for you! And can't thank you enough for all you have shown me in the past week! It ALL works so fine!!!! Yay you can keep running, 5k runs will give you an excellent level of fitness. Although I mourn with you the loss of the longer runs. I did NOT fol\low my doctor's advice about taking the bone density meds: but generally, I do!! Glad they are allowing you to run. 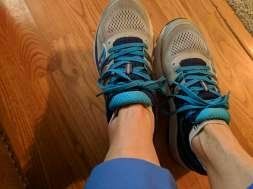 A simple fix to help out with your bunions, who would have thought? I will have to pass that on to my Mom. and thank you for the pics of the shoe tie trick! Hooray for ANY miles! Happy trails, and be safe, even down in sunny Florida! Shoe tying tips tare so helpful. So glad you can run again. Great idea re easing the tightness on bunions! On my "to do" list from now on so thank you. Better to be able to run than be told "No more running." Glad you've been cleared to run 8 - 10 miles a week. And, thanks for sharing the tip about the laces! No bunions on our feet; but, I have friends with bunions that might benefit from that tip. I find doctor's advice interesting sometimes. The health professionals guiding recovery from the non-traumatic pelvic fracture I experienced never mentioned the number of miles run/walked/hiked. It was how many days a week of weight bearing impact activity (which includes taking walks, hiking, running) that was their focus. So, I've been advised not to walk/hike/run more than 3 - 4 days a week. And, for the most part, I have followed that advice since June 2015. And, the pelvis is okay. It still grumps from time-to-time. But, nothing of concern. The importance of recovery and downtime was stressed. Another suggestion was ideally 2 days of recovery between each run. I did that when I first returned to running and over months worked up to 1 day of recovery between runs and occasionally ran two days in a row or twice in one day. Our bodies are all different and medical advice is different. It was also suggested that I consider swimming, stationary bike, elliptical and rowing for cardio activity that is not what they classified as weight bearing impact activity. I have yet to find an unchlorinated pool or place to swim regularly and the elliptical hurts my body, especially my hips. So, I stay off of it and have stuck to the stationary bikes and rowing machines. Gentle pedaling (10 mph - 12 mph) for an hour yesterday evening. It felt good. I'm going to pass this tip along to a niece that has bunions. Great that you are going to partially resume your running activity. AWESOME advice!!!!! glad that the foot is coming along! Compromise is better than no running at all. Good luck. Great to get a clearance to work out again. So, is the secret that you're skipping the first set of holes? So glad your Dr cleared you to goo back to walking. They taught me how to tie my shoes at fitNiche, so my heels won't rub. Right now, all my sneakers are tied that way. I had to buy a wider shoe.